Chicken soup is part of my weight loss program. I lost 25 pounds eating healthy soups and vegetables within 6 months. 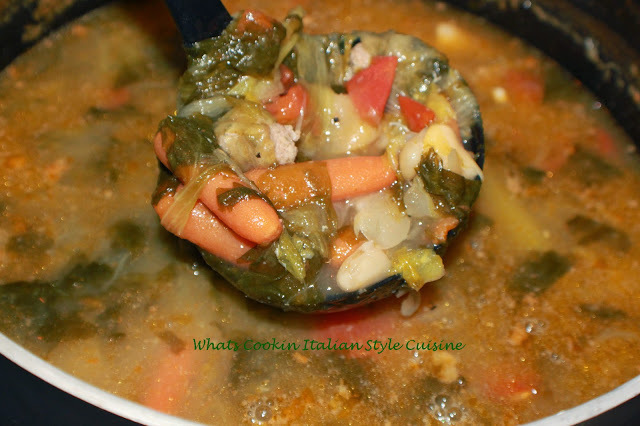 The beans are added for proteins and make a delicious addition to this soup. Wash escarole cutting off the large stem on the bottom and boil it in large pan (of salt water to cover the escarole around 1 teaspoon salt) for around 1/2 hour drain and set aside. This is to remove any dirt in the escarole. Fill a 5 quart saucepan with water, leaving around 4 inches of space from the top of the pan making sure you have room for all your ingredients. Add the chicken, salt, pepper, a little cayenne if you like heat, some fresh parsley, garlic powder and 3 whole garlic cloves and boil at least 1 hour to make a rich broth, scooping off the foam that it creates, sometimes it takes longer. Remove the chicken and the garlic (if you don't want to eat the cloves) from the pot and after it's cooled cut the chicken into small pieces, you can mash the garlic and put it back in or throw it away if you don't like too much garlic taste. Add the boneless chicken, carrots, celery, spices, tomatoes and escarole, beans and simmer on low for around 1 hour. Serve soup with grating cheese on top. If desired add cooked pasta of choice. 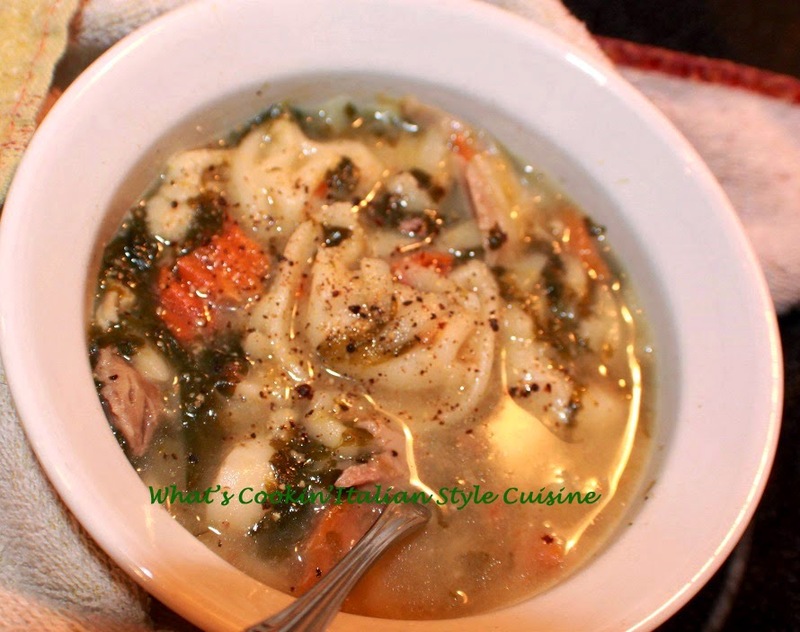 Tortellini is the perfect combination of flavors. Sounds good! I've never had soup w escarole. Great with your weigh loss!